This pasta is another favorite in my house. It makes the perfect meal when you are in the mood for something light. I don't know about you, but when it's really hot outside I don't want a heavy meal. This dish is easy to prepare and weight watchers friendly so you can enjoy it without the guilt. Boil pasta as directed on package. Meanwhile, in a large skillet heat olive oil and add in tomatoes Saute for 5-6 minutes, add garlic and red pepper and turn heat to low. Add bacon and immediately toss with cooked pasta. Top with shredded Parmesan cheese. Enjoy! 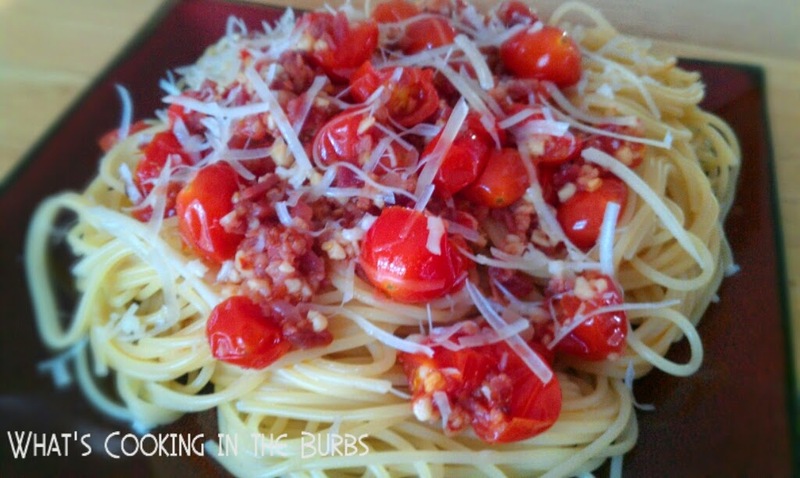 I love making a roasted tomato pasta an you added bacon! Everything is better with bacon right? I've never put bacon in my pasta salad, this sounds great. Love the angel hair pasta too. Pinned! Bacon, parmesan cheese and pasta? Who could go wrong?? Love it!! That sounds so easy and delicious! Will definitely be pinning and trying! I hope you enjoy it, Jillian!